The good stuff just keeps rolling in. 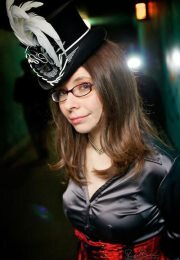 Here's another super customer, Megan, who has I-don't-even-know-how-many House of Nines Design hats at this point. She has an eye for one-of-a-kind and custom pieces, and uses them to accessorize her wardrobe in a way that's really fun. And she's been buying hats of mine since the beginning of my business, so looking through her collection is fun for me, like seeing old friends from years ago. 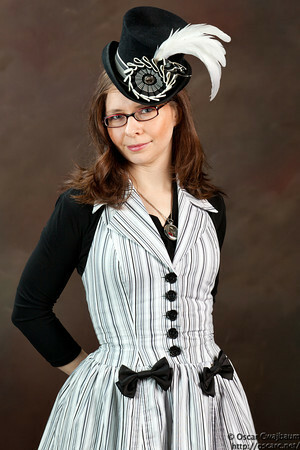 Here's Megan in a one-of-a-kind 'Belle Epoch' mini top hat in black fur felt with black and white striped ribbon trim and a big cockade. She was using this one as her Facebook profile photo for a while, and I was very flattered. Top hats at the Aquarium? I'm all for it. I think these were taken at San Francisco's Aquarium of the Bay, where I recently did some research for aquatic-inspired hats for Spring / Summer 2013 (stay tuned). 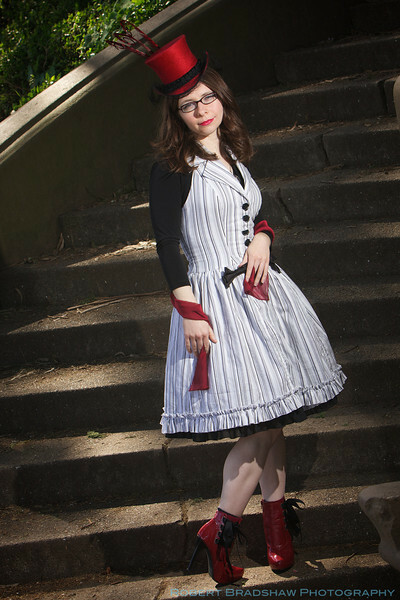 Here's another 'Belle Epoch' from Megan's collection. This was a one-of-kind item as well, because I only had two of these antique mother of pearl buckles used to provide a knot for the bow, and I plan to use the other one on a totally different hat. (But, I still have just a few pieces left of this vintage, very limited vibrant purple long-nap fur felt if anyone is interested.) 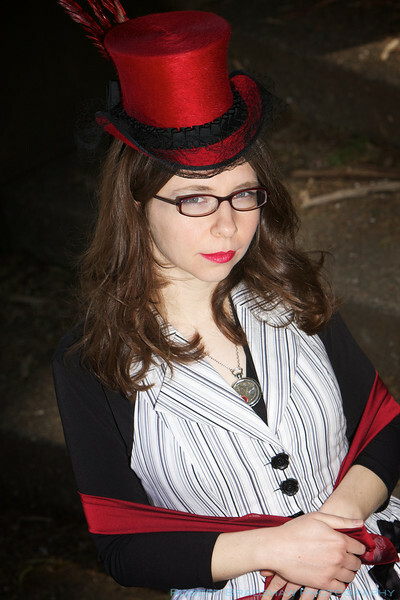 She's further customized it on her own by swapping in feathers from a red 'Una' top hat. A close-up of Megan in her 'Una'. Ok. So, in the following photo, Megan is not wearing one of my hats. It was mixed in with the photos she sent me, and when I realized it was her, I was so humored that I had to share it. 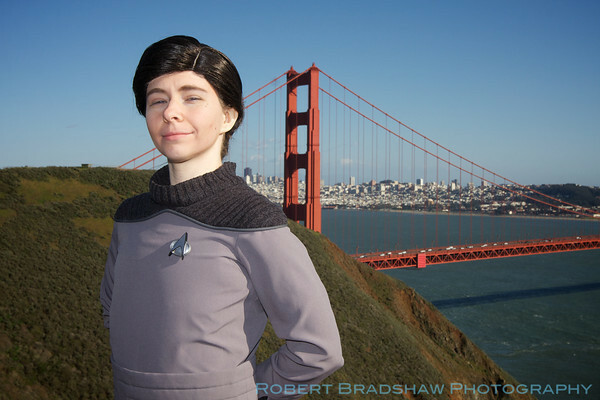 This is Megan in Wesley Crusher drag, standing proudly in front of Our Fair City, the future home of the United Federation of Planets. It made my day. 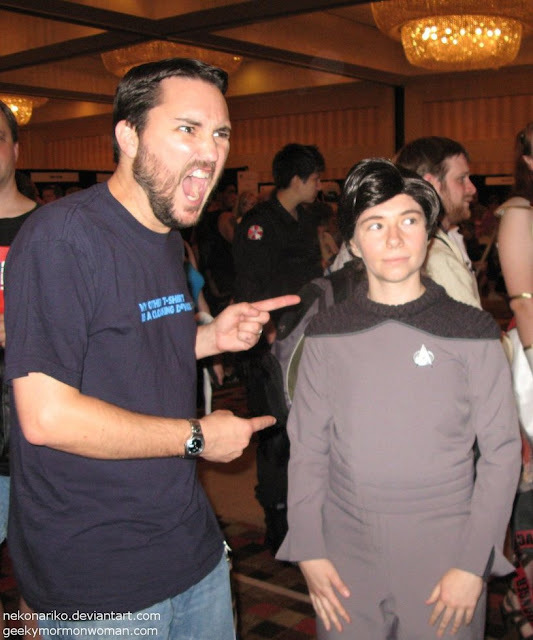 When I let Megan know how happy the last photo made my inner geek, she sent me the following photo of Wesley Crusher meeting Wil Wheaton, and it made my MONTH. Judging by Wil's reaction, it did the same for him. Assuming that this face of Wil's means "Brilliant!" (what else?) I'm feeling the same way about her. Many thanks to Megan for sharing these super great photos. Have some of your own? Send them in!